Ok so here we go… !! Adriana Marie is fearless!! 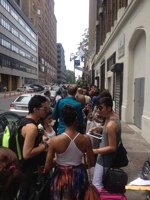 In a saturated city full of designers, she is taking on this casting call with NBC for a show called Fashion Star. 35th street in the garment district is filled with a long line of spiked hair, tall heels, endless garment bags and tons of hope! Reblogged this on NOAH'S HEART.